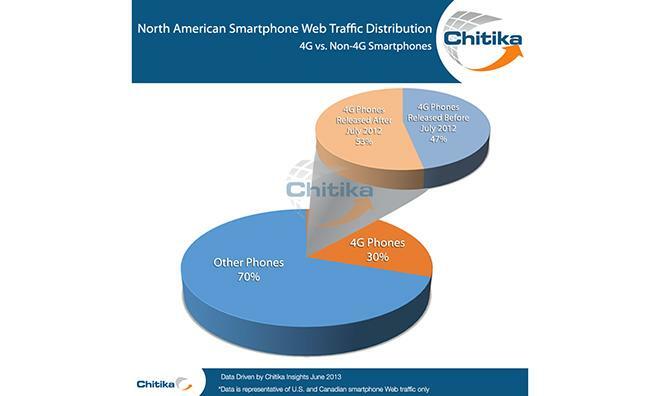 According to a report from ad network Chitika, the iPhone 5 accounted for just over three quarters of North American 4G Web traffic generated by phones released after July 2012, which translates to a 40 percent share when including all 4G-capable smartphones. The study, conducted over the first two weeks of June, showed 4G-ready handsets accounted for 30 percent of all active smartphones in the U.S. and Canada. The remaining 70 percent consisted of "other smartphones," like 3G and 2G wireless models. Chitika based the report on tens of millions of smartphone-based online ad impressions on its network from June 1 to June 13, 2013. Further breaking down the numbers, the firm found 53 percent of ad impressions came from 4G smartphones released after July 2012. This includes Apple's iPhone 5, which was introduced in September of last year. The LTE-equipped iPhone 5 snagged some 40 percent of total traffic from 4G handsets, and 76 percent of traffic from smartphones brought to market after July 2012. Other notable 4G smartphones seen in the study include Samsung's Galaxy S4, HTC' s One LG's Nexus 4, and both BB10 BlackBerry devices. The firm noted that the results show newer model 4G phones are driving more traffic than their predecessors, even counting the latter's advantage of being on the market for months. Still, there is room for growth as cellular technology advances, and telecoms slowly allot more spectrum to 4G. Earlier on Friday, market research firm comScore released its own set of numbers, showing Apple's iPhone lineup to be the handset of choice for the U.S. market. Combined model sales grew to 39.2 percent in July 2013, a boost of 0.3 percent mont-ober-month.